Spoiler alert: There are no spoilers in this post. My eyes are red, I’ve hardly slept and I’m being fuelled by a combination of chocolate and Diet Coke. Yes, I’m addicted to Breaking Bad; I’ve been watching it back to back, late into the night, because I CANNOT STOP. The last series I did this with was The Wire, but then it was one episode a night. I’ve been watching Breaking Bad properly back to back. Five seasons in a fortnight. With one episode left to go. Yes I know I’m late to the party, but better late than never. And I actually didn’t expect to become addicted to Breaking Bad at all, because for me, the first two seasons weren’t particularly strong. If I compare them to the first season of Ray Donovan, or Lost, or The Wire, or Boardwalk Empire, or The Leftovers, well, no contest. In fact my first impressions of Breaking Bad were that it was watchable and fun, the central characters were endearing (these were first impressions, remember), but the continual ‘Jesse and Walt get into a scrape’ scenario was a little repetitive. I know quite a few people who actually gave up after season 2. But trust me, it’s worth sticking around, it really is, because the character and plot development in seasons 3, 4 and 5 is exquisite, some of the best TV you’re ever likely to see in terms of acting, writing and production, up there with the best seasons of The Sopranos and The Wire. 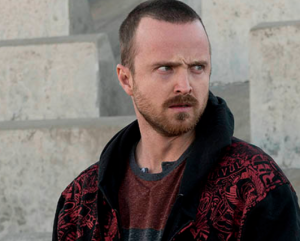 And one of the biggest reasons to watch Breaking Bad, apart from the excellent Bryan Cranston as Walter White, of course, is the character of Jesse Pinkman, as portrayed by the delectable Aaron Paul, who conveys just the right balance of vulnerability and edginess. All the cast, though, are excellent, including Anna Gunn as Skyler (such a great name) and Dean Norris as Hank. It’s simply must-watch TV. So now, I’m going back in for the final episode, hopeful that there will be a proper conclusion to Breaking Bad that doesn’t leave you guessing. Gotta bounce. Our Winnie the Pooh review – plus win official goody bags too! My American friend says it is Shakespearean – I’m even later to the party = haven’t watched any yet, but going to have to – can’t ignore it anymore! Ha – Its more addictive than the meth they are cooking – The last box set myself and my fiance watched was 6 Feet under (utterly brilliant) my fiance then refused to watch anything else and was wanting to watch 6ft under again – that is until i got her hooked on Breaking Bad – this is my second run through it and i am enjoying it just as much as the first viewing.